If you’ve been following this series on learning to shoot a compound bow, you should now be comfortable with everything from your stance – the way you align your feet and body before beginning the shot – to gripping the bow, nocking the arrow, drawing the bowstring, and finding your anchor point. Now you’re ready to take aim and arrow your target. The first step of aiming involves transferring weight into your back muscles. Once you anchor after drawing your compound bow, you must transfer the held weight from your arms into your back muscles. This makes it much easier to hold the bow steady. You transfer this weight into your back by moving your draw arm’s LAN 2 muscles – the triceps muscles along the back of your arm – in an angular motion away from you, and your scapula (or shoulder blade) toward your spine. Think of it like drawing a circle with your shoulder blade. Take note: The LAN 2 is not an actual muscle group but a term given to the drawing arm’s triceps area. So if your science teacher asks what you mean by LAN 2, now you know! Once you fully transfer this weight, your draw elbow will be in line with your arrow, and you’ll feel like you can hold the bow forever. Awesome, right? Now that you’re aligned, you begin your aiming process. Focus your eyes through your sight-pin or scope to the target. 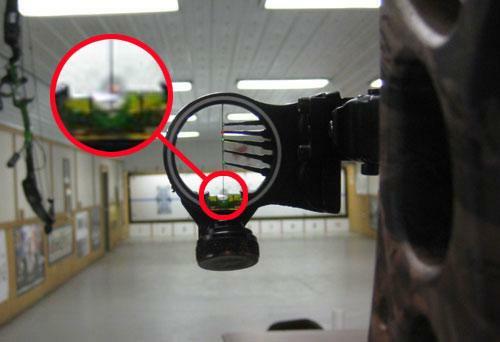 It’s important to keep the sight-pin or scope centered inside your peep, and the level’s bubble in the middle. As you look at the target, watch the pin (or dot) float around the center. It’s important to not try to force your pin to hold steady. It will never appear perfectly still on the target. Trying to hold it too still can create unnecessary tension in your bow arm. In fact, if you’re not relaxed while aiming, you can make the pin move more. You can usually focus on seeing the pin move in a “figure 8” pattern. This helps the eyes relax more since the pin can hover around the center more naturally. Once you start aiming, you must get ready to release the shot. All the steps of a shot before releasing were important up to this point. It’s now essential to maintain proper tension in your back muscles while creating a feeling of expansion across your chest. This allows you to make a consistent release every time. Compound shooters use some type of release aid, which by itself is more consistent than using your fingers, and keeping proper back tension will help keep your body consistent through the shot. A consistent shot process is what puts arrows in the bull’s-eyes. Once you’ve mastered all the steps – from stance, posture and set-up to draw, anchor point and aiming – you’re ready to release your arrow. Stay tuned to our compound bow how-to’s for more tips on an accurate release technique.